This article is about an airport in Croatia. For the similarly named airport in Chad, Africa, see Bol Airport (Chad). Brač Airport (Croatian: Zračna luka Brač; IATA: BWK, ICAO: LDSB) is an airport on the Croatian island of Brač, close to the town of Bol, after which it is sometimes also named informally. It is one of three island airports in the country (the other two being Krk – Rijeka Airport and Lošinj – Lošinj Airport) used for commercial passenger flights, mainly charter traffic from Europe during the summer season. Brač Airport is situated in Veško field, 543m above sea level. It is located some 14 km from Zlatni Rat (Golden horn), one of the top beaches in Europe, and 30 km from Supetar, the largest town on the island. Due to airport's elevation as well as the vicinity of the highest island's peak, Vidova gora, there is a possibility of fog, low stratus and poor visibility. There is also a possibility of snow, but only for a few days during winter. The most frequent winds are bora (NE) and jugo (SE) and temporary light winds, such as maestral (W) and burin (NE). Brač Airport is equipped for acceptance and dispatching of a smaller commercial aircraft up to 100 seats during both day light and night. It is open all year long. Charters and scheduled flights typically operate only during the summer season. Public transportation is not organised however a taxi service is available during airport opening hours. Brač Airport was opened on 22 May 1993, making it Croatia's youngest airport. The present terminal building opened in 2007. Between November 2016 and March 2017 the runway was lengthened from 1,440 to 1,760 meters towards the southwest, allowing the airport to handle aircraft such as Airbus A319, Bombardier C-Series and Embraer 195. Work was valued at 666,000 euros. The second phase of runway extension will see the runway lengthened towards northeast from 1,760 to 2,350 meters by June 2018, enabling unrestricted aircraft handling of Airbus A320 and Boeing 737-800. ^ "EX-YU airport race 2018". www.exyuaviation.com. ^ "AIP]". European Organisation for the Safety of Air Navigation. ^ "10 Best Beaches in Europe". CNTraveler. 14 July 2016. Retrieved 25 December 2016. ^ "Best beaches in Europe". europeanbestdestinations.com. Retrieved 25 December 2016. ^ "History - Zračna luka Brač - Airport Brač". airport-brac.hr. ^ "Brač Airport to begin runway extension". www.exyuaviation.com. ^ "Brač Airport completes runway extension". www.exyuaviation.com. ^ "Brač Airport Expansion Draws TUI and Eurowings". ^ "Scheduled and charter flights summer 2019" (PDF). Tiroler Flughafenbetriebsgesellschaft m.b.H. 7 February 2019. Retrieved 9 February 2019. ^ Tuifly. "Promotions". tuifly.be. Retrieved 12 January 2017. ^ Kotek, Jan. "TUI Airlines Belgium uvodi novu liniju za Brač iz Nizozemske". ^ "PROMET U ZRAČNIM LUKAMA U PROSINCU 2011 TRAFFIC IN AIRPORTS DECEMBER 2011". www.dzs.hr. ^ "PROMET U ZRAČNIM LUKAMA U PROSINCU 2012./TRAFFIC IN AIRPORTS DECEMBER 2012". www.dzs.hr. ^ "PROMET U ZRAČNIM LUKAMA U PROSINCU 2013./TRAFFIC IN AIRPORTS DECEMBER 2013". www.dzs.hr. ^ "PROMET U ZRAČNIM LUKAMA U PROSINCU 2014./TRAFFIC IN AIRPORTS DECEMBER 2014". www.dzs.hr. 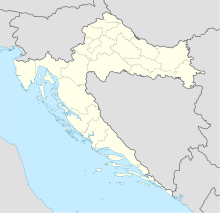 ^ "CROATIAN BUREAU OF STATISTICS - REPUBLIC OF CROATIA". www.dzs.hr. ^ "EX-YU airport race 2016". www.exyuaviation.com. ^ "EX-YU airport race 2017". www.exyuaviation.com.